Some divers, as well as some diving environments, need a little more than just the standard 7mm wetsuit. Here at Dolphin Scuba Center, we have the perfect option for you. With seals at the wrist and neck and attached feet, you can stay warm and dry throughout the coldest of conditions. If you want to go all the way, you can even purchase a dry hood (check out our Hoods section). The myth is that drysuits are prohibitively expensive for the average diver, but that is not the case at Dolphin. 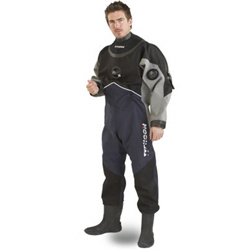 Drysuits come in a variety of styles and a wide range of prices. Dolphin Scuba Center is proud to sell Typhoon Drysuits. Typhoon is hugely popular in Europe and is used by many military institutions around the world for professional military divers. We are also a proud Diving Unlimited (DUI) dealer. With the wide range of prices and styles--Dolphin Scuba Center can keep you warm and dry while still staying within your budget.